The raids off the West African coast invariably follow the same pattern. At night or in the early hours of the morning, a flotilla of pirate dinghies or speed boats fans out across the water heading off in the direction of their prey – an oil tanker or cargo vessel – which they then attack and board. Efforts to defeat piracy off the coast of Somalia have been relatively successful and it is now in decline. However, it is now on the rise in the Gulf of Guinea. Countries that share the Gulf of Guinea coastline such as Togo, Benin, Nigeria have turned into a new hub for Africa’s pirates. According to the International Maritime Bureau (IMB), which is part of the International Chamber Of Commerce, more than 205 pirate raids in the Gulf of Guinea have been recorded over the past 11 years. An African Union-sponsored summit on maritime security is being held in the Togolese capital Lome from 10th – 15th October. Togo’s foreign minister Robert Dussey told DW the summit will address piracy, illegal fishing and human trafficking and discuss the role of the sea in Africa’s development. These issues are all interlinked, says Holger Grimm from Germany’s Friedrich Ebert Foundation. Africa derives almost 90 percent of its revenue from the export of products via maritime routes. More specifically, illegal fishing and overfishing by national and international fishing fleets are depriving many coastal residents of their livelihoods. Near the coast, there is now virtually nothing left to catch apart from small fish. It is therefore relatively easy for criminal gangs, whether specializing in drugs, arms or piracy, to recruit unemployed youths for their illicit activities. “In many countries in the region, the birth rate is very high and there are far too few jobs for young people to handle this demographic challenge,” Grimm said. 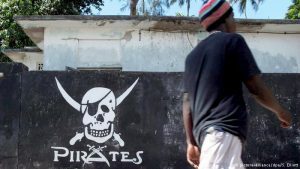 Gisesla Viera from the International Maritime Organization, a specialized agency of the United Nations, says that there are several reasons why piracy off the West African coast refuses to disappear. “Corruption plays a role, there is also a lack of communication and coordination. There is also a lack of funds to fight piracy,” she said. The Lome summit wants to find solutions for these problems. The meeting of African government representatives is a follow-up conference to a maritime summit in Yaounde, Cameroon in 2013. “Unfortunately, nothing much happened after the Yaounde summit finished,” Grimm said. A coordination center, which was to develop strategies for improved maritime security and coordinate solutions, was actually founded in Yaounde. But it was hampered by a shortage of funds, it was unclear who was responsible for what and people also simply failed to communicate with each other properly. The plans for the Lome summit are rather more tangible. The aim of the meeting will be to draw up and sign a charter on maritime security. “Drawing up the charter involves decision-making and on the basis of these decisions, it will be possible to usher in a specific course of action depending on circumstances and also gauge the success or failure of such action,” Grimm said. There are plans for a committee which will oversee the implementation of the charter. Foreign support for this African project is essential, Grimm says. Organized crime is becoming increasingly proficient and it uses digital technology to cover its tracks. This is where Africa could use logistical support from abroad. Nevertheless, it would be wrong to place everything in the hands of an external organization. An international approach coupled with meaningful cooperation would be the right way forward, Grimm believes.